We received this book from a great friend right after I began NaNoWriMo - like literally the next day. So when I wasn't writing, I was reading this. I'm not a big biography reader, honestly, or autobiography, although I did have to read some for school. But I had been really eager to get this. I'll be honest, I loved Dubya. Yup, I said it. On the record. On the internet, where it will never be erased. So I was really interested to read his account of his experiences in the presidency. The book is written differently than other autobiographies I have read. For one thing, it's not a chronological history of events. There is a general chronology, of course: first chapter - growing up. Second section - before being President. Rest of the book - President. Epilogue - Day after Obama inauguration. Other than that, it's organized topically. For example, anything about the war in Iraq, regardless of when in happened, is in one chapter. Same with economic issues or Katrina. And the book isn't written like, "This is what happened. This is what we did. Then this happened." It's not about the events themselves. It's about the decisions he had to make, for example, when dealing with domestic education issues, what information was available to them at the time, who he consulted for expert advice, and how he arrived at the decisions history already records. Most of the book dealt with, for me, familiar territory. Many things I remembered learning about or knowing at the time that most people even still today don't know about because of how the media and public education presents them. For example, according to the law, it was illegal for FEMA and the federal government to swoop in after Katrina and take over relief efforts without the local and state authorities asking them to. And neither the Governor of Louisiana nor the Mayor of New Orleans was willing to let the Fed in. In fact, Bush asked to go in and start mounting recovery and relief activity within hours of Katrina's landfall. The Governor refused for a week. When Jerry Falwell died, Ann Coulter wrote that she began to think that his legal name was Jerry I-didn't-always-agree-with-him Fallwell because of the way he was often eulogized. That's how I feel about George Bush. Guess what? I don't always agree with SoldierMan. Or my mom. But that's no reason to say, "Yeah, he's a nice guy but I didn't always agree with him" at every opportunity. I think that sounds, well, snooty. The key to being able to read this book is to take off your Captain Hindsight glasses and walk through these experiences with him, based on the information and advice he was given at the time. In many of the cases, I probably would have made the same decisions. And I think, depending on your values system, you probably would have, too. And even if not, even in the cases where I read it and go, "Yeah, I see where you're coming from, but no," I still can respect the factors that went into those decisions. The biggest thing I loved was finally seeing his fight come out. As the son of a President, he fought hard and vicious for his dad. He did the same as the brother of a Governor. But when it came to himself, my biggest pet peeve was that he never confronted the many media misrepresentations - oh, who are we kidding, outright lies - about his Presidency, his person and his policies. In this book, in many places, he finally takes to task the establishments that sneered and lied about him for eight years. In typical Bush fashion, though, he refuses to name names. He never uses personal attacks. He just cites facts. My favorite repeated topics were Vladmir Putin and Tony Blair. Watching those relationships evolve over eight years from Bush's perspective is fascinating. Putin scares the crap out of me, btw. I guess the point is, I really do recommend this book. I'm sure he had someone helping him write it, all the bigs do. (Hillary Clinton had 4 ghostwriters on her autobiography. 4!) But it's still vintage Bush. Self-effacing, humorous and full of reverent faith. Go to your local bookstore and just read the first chapter for free while you enjoy a cup of Starbucks. You'll get hooked. Now, I know this will be ripe fodder for haters. I don't like haters. If you come here to hate, well, it's my blog. You're, of course, always free to disagree. But being all nasty on here will get ya deleted. Yup, I said it. My hubby really want to read this book. We're both Bush supporters and I don't mind saying that on the internet:) After reading your review, I want to read it too! I think I'll get it for him for Christmas and read it when he's done! I love this man! I am so excited to read this. I saw his Oprah special and it just had me riveted! I love Dubya as well! And this book was pretty amazing. I am a fan of biographies but they usually take me longer to read; I flew through this one! I'd love to read his book! I need to add it to my to-read list. 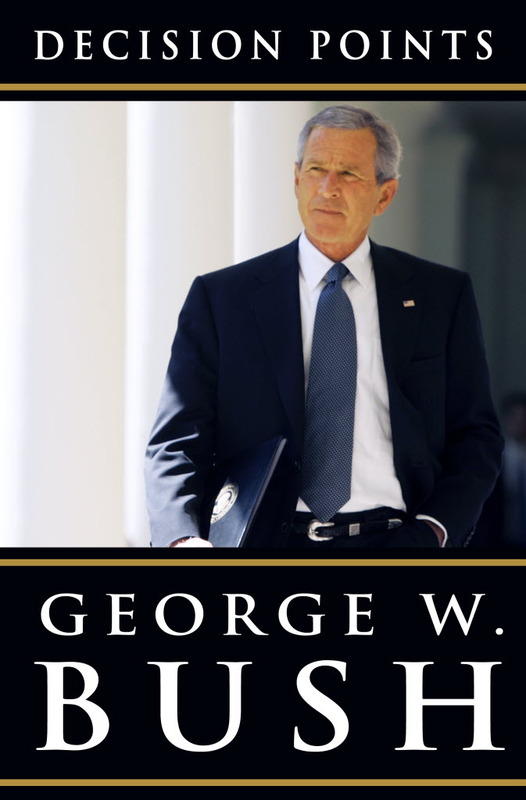 I love the book as well and I am a HUGE Bush Supporter and I think he is a wonderful man! I am by no means a fan of his (and that's being nice about it) but I am interested in reading this book...as soon as I can pry my kindle from the husbands hands, I'll get right on it. I big puffy *HEART* Dubya. I'can't wait to read it. i love DUBYA to pieces!! i think he did a great job with what he was dealt! he is a man of integrity and great character and i can totally support that!!! I bought this for my husband, so it was good to see your review!